This book is the much anticipated sequel to the New York Times bestselling book, Stargirl and centers around "the world's longest letter" in diary form. It picks up where the previous novel left off after Stargirl left Mica High and describes her bittersweet memories in the town of Mica, Arizona along with the involvements of new people in her life. 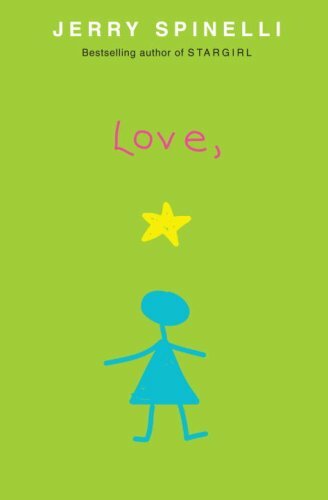 In Love, Stargirl, we hear the voice of Stargirl as she reflects on time, life, Leo, and - of course - love. Reminiscent of the first one, cute and simple! Once again, I'm instantly smitten with Stargirl! I loved this book! As much, if not more, than I loved the first one. The first thing that struck me was that this particular story is from the point of view of the infamous Stargirl herself. She is writing a "letter" to Leo, that ends up as more of a long set of journal entries. Her writing is sweet, funny, touching, and just a delight to read! As you read along, you meet the new cast of characters in Stargirl's hometown and fall in love with them as well. From the tiny Dootsie, to the infamous Perry, her world is filled with new and interesting people with their own quirks and issues. I loved how well she fit into this new world. I think my favorite part about these books in general is just how true Stargirl is to herself. Like all of us, she has moments where she doubts herself, but she always manages to come back to her true self, grow, and move on. How I wish I were as brave as she is! All I have to say is....Leo and Stargirl forever.